Space, a big place full of scary stuff, ill advised to both visit and to look at for extended periods of time. This vast area of… well… space, makes it’s cameo appearance in Laughing Jackal’s game, Orbit. So how does it turn out? Well… not well. This is your basic “Go as far as you can” launcher-type game. In Orbit, you take control of a scientist working for the Institute of Space Research Institutes… yeah. Hope you enjoyed that right there, because the game is chock full of “jokes” just like that, and by jokes I mean loosely worded phrases designed to annoy you into oblivion. 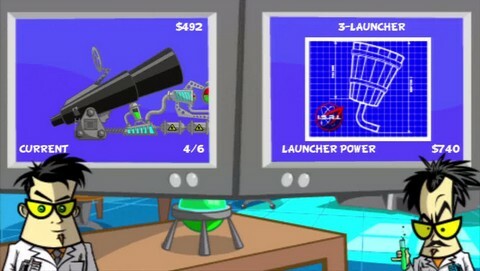 Gameplay is controlled completely with the X button — it stops the power level on the launcher, and it uses fuel to fly your scientist during flight. The R1 button activates boosts you can use during flight to gain extra distance, and it gives you the ability to power through all the junk in your path, but we’ll get to that later. As far as controls are concerned, they get the job done, but don’t expect to be impressed. As the graphics, they just seem rushed. Most items you encounter do the classic two-step static animation, switching back and forth between two frames to create the appearance of actually doing something. The backgrounds look fine, but everything past the first level is so eye-burningly bright that I literally had to turn down the settings on my TV. The sound is a tad better; though the Menu music and typewriter sound effect you hear when characters “talk” will drive you insane. The music on one level sounded eerily reminiscent of something out of a PS1-era Spyro game, which was great and worked ridiculously well for what was happening. Other than that, don’t expect anything worthwhile. You could argue that this is a Mini and it doesn’t cost much in the first place, but hat doesn’t mean some polish can’t be put into the backgrounds and animations. The story is sort of a “what-if” spin on the U.S. space program situation. Basically, the space program is shutting down because it has no funding when suddenly a scientist discovers that gold ore is mysteriously appearing in space. Neglecting to tell anyone of this monumental discovery, he decides to go out with his fellow scientist, alone, to collect as much as possible to fund their space expeditions. During this your primary mission is to complete a circumnavigation of each planet you visit while also collecting blueprint pieces and “relics”. You learn early on not to question the game’s logic; it even tells you not to after you discover you’ll be doing your first launch without a spacesuit, or spaceship. Ridiculousness aside, I was willing to give the game a fair chance and not take it at face value. In many cases, crazy story elements and gameplay mechanics can make a title stand out against the crowd, offering experiences unlike others in the genre. Sadly, Orbit falls short of what it aspires to be. First off, the only control you have over the launcher is power level. This may not seem like a problem at first, but when coupled with the indescribable amount of junk that populates the area of space you are currently trying to launch through it becomes a very big problem — the developers seemed to think that the more stuff you run into, the more fun the player has. Maybe this seems like a minor complaint, but let me throw a situation at you. You’re playing the game, about to launch and you stop the bar in the green zone, perfect right? You leave the launcher, barely fly a short distance and instantly hit a floating space rock, losing all your speed and starting out at a weird angle. Sound annoying? Well prepare yourself, because it happens constantly, as the “space junk” has a static position in each launch instead of being randomly spawned, forcing you to either upgrade the cannon and hope to miss it or purposely fire with less power. Now for the upgrade system, it’s there, it works, that’s about it. Nothing special here: upgrade the cannon, your character during flight, his boosting ability, buy boosts, a windshield wiper or radar. Those last two confuse you? Well, the windshield wiper gains its use from a set of three enemies. One steals your fuel during flight, another your gold, and the last just covers your screen with their green splats. The windshield wiper is supposed to clean your screen when the aforementioned enemy covers it. However, the splats disappear normally in about the same time it takes the wiper to wipe them off, and the wiper actually obscures more of the screen than without it. Now the radar is used to help you find the collectable items on each level. This works perfectly, and it’s almost necessary to find all the collectables on each level, as some of them tend to be obscured by all the space junk. Fun in short bursts, dull over extended periods, Orbit gets repetitive fast and is another game that falls short of what it could have been.